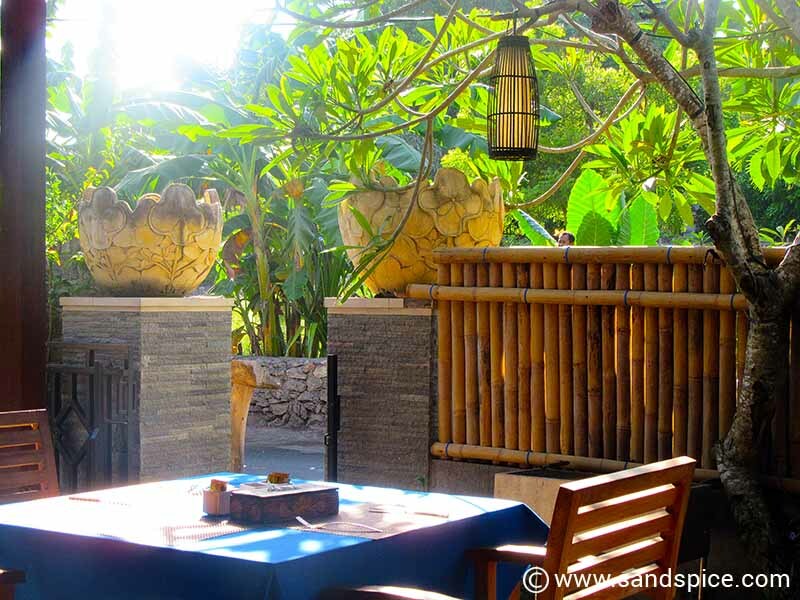 How do Lembongan island eating out experiences compare to Bali? 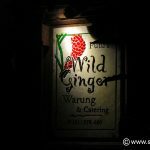 Your eating out options in Lembongan are plentiful enough. 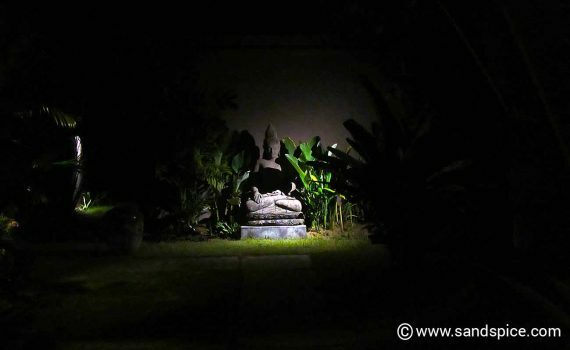 Every guesthouse offers a menu, and there’s a good variety of standalone restaurants and warungs. 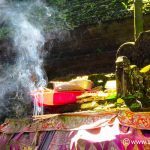 During our 8-day stay on the island we had the opportunity to sample much of what was on offer, but which of our Lembongan island eating out experiences would stand out from the rest? 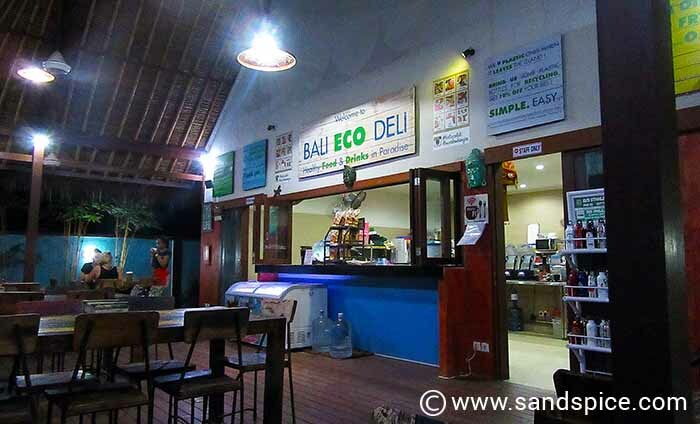 The Bali Eco Deli is located around the center of the Jungut Batu main strip in the northwest of the island. This place came highly recommended, so we dropped by to try out their deserts. We paid IDR 100,000 (€6) for 2 cappuccinos, a so-called ‘healthy’ version of a chocolate brownie and a portion of apple pie. These were easily the worst cakes we’ve ever tasted, with little resemblance to their namesakes. If this is what hippy eco food is all about, give me the unhealthy original version any day of the week. If you insist on eating here, be prepared to pay over the odds for the privilege, and leave your taste buds at the entrance. 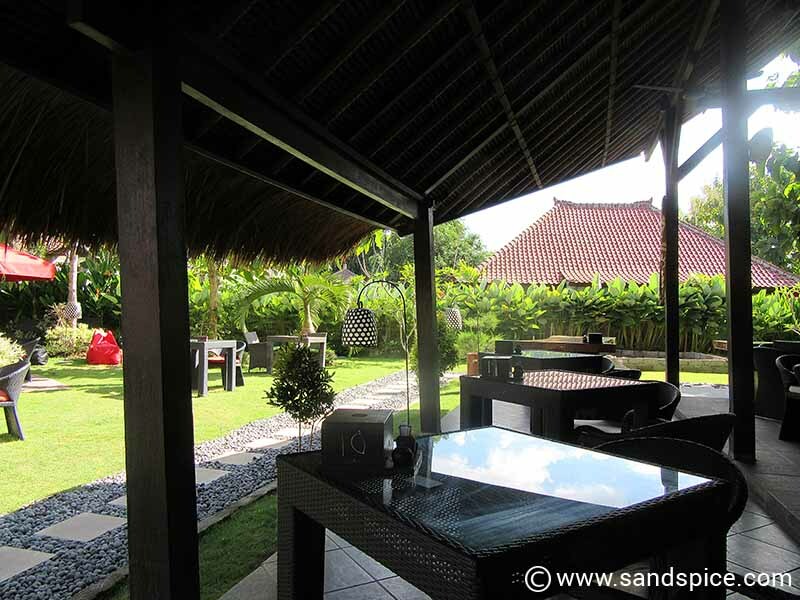 The Akah Cottage is a small 6-bungalow resort with pool and restaurant located in the south on Jalan Devil’s Tear, between Dream beach and Sunset beach. It’s a low-key place a little off the beaten path, but their restaurant food is freshly-made and really tasty. We were first won over when we stopped by one lunchtime to try their delicious chicken curry – almost a soup – and the best we’d tasted since Hong Kong. We returned in the evening to savour their Sweet&Sour Pork and Nasi Campur, spring rolls, chicken sate and banana fritters. The prices were very reasonable, ranging between IDR 100-200,000 (€6-12) for a meal for 2, including beers. We liked the place so much we checked out their cottages for rent. 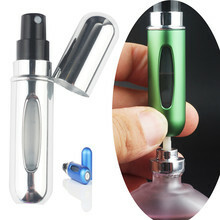 These were impeccably clean and fully equipped. We were just sorry we hadn’t found them a few days earlier. 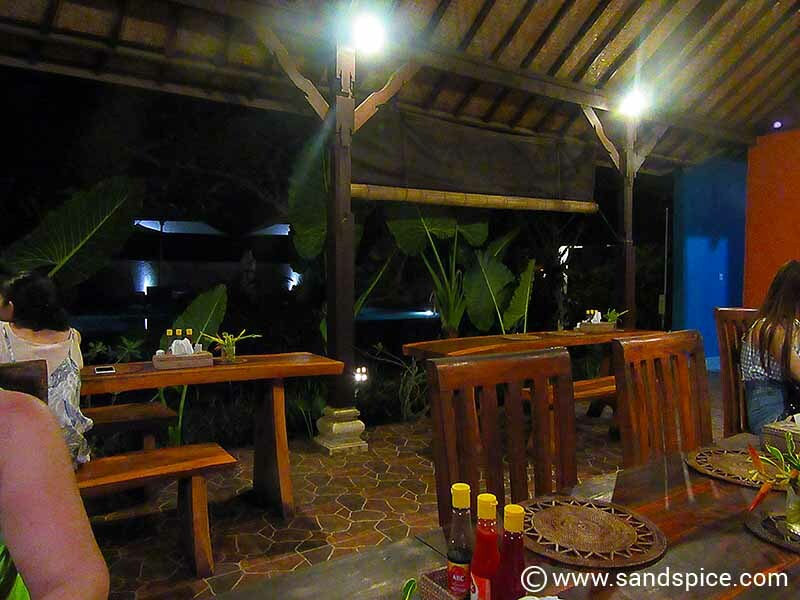 The Adi Warung is located not far from Mushroom beach, next to TS Huts. We paid IDR 155,000 (€9) for an acceptable but very basic, bland meal for 2. This comprised a dish of chicken curry with rice and a plate of beef with rice, together with a couple of beers. There are better eating options to be found elsewhere in Lembongan. The Alam Nusa Huts are also located close to Mushroom beach. Their tables are arranged in a spacious and pleasant candle-lit garden. The food here is not just tasty but well-presented, and the atmosphere is really relaxing. We liked it so much here we came back again a few days later. We ordered a tasty meal for 2 which included a chicken and vegetable stir fry and teriyaki chicken. Together with a couple of large Bintang beers, our bill came to IDR 151,000 (€9). Since we were staying at TS Huts for a few nights, it was only natural that we’d try out their restaurant. 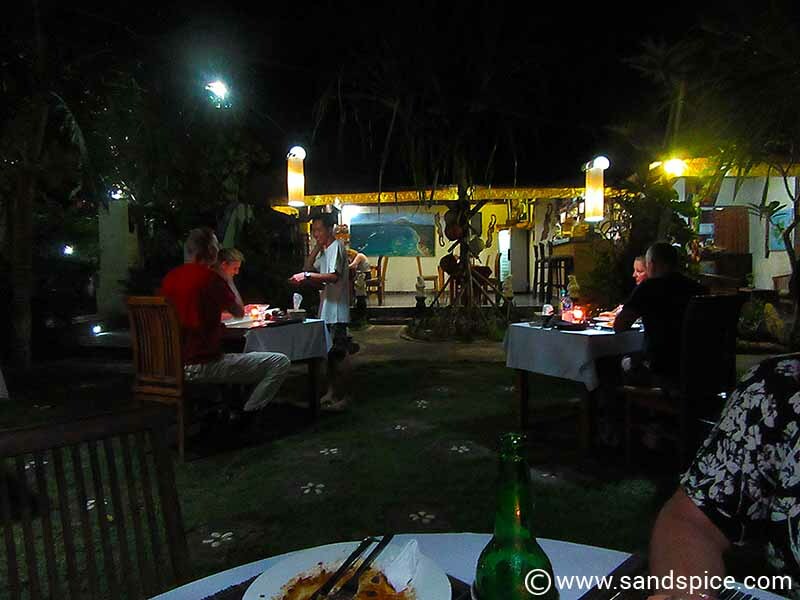 We were very happy to be served tasty balinese mains with banana crumble desert and large inexpensive beers. 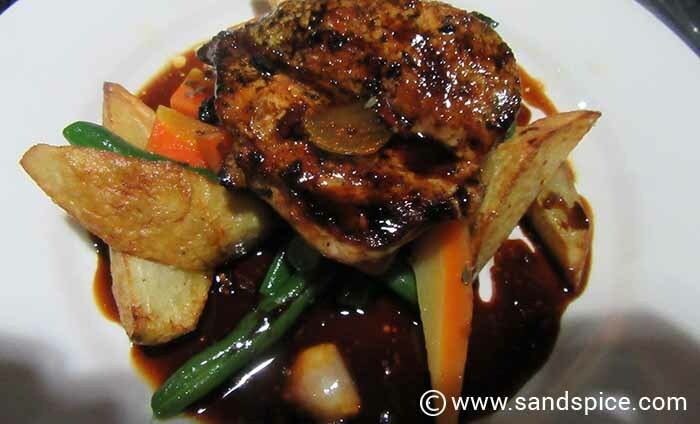 Our dinner for 2 with drinks came in at IDR 190,000 (€12). Directly across the road from TS Huts is the Gomez Mexican bar & restaurant. Actually more a bar than a restaurant, this place can get a bit rowdy in the evenings, with kids getting hammered on tequila shots. If you’re looking for something a bit more up-market, then the L Good Bar & Grill may be the place to go. It’s located on the main street just 5 minutes from Mushroom bay. Set in a large beautifully-kept garden area, the L Good Bar & Grill is a bit pricier than it’s competitors. 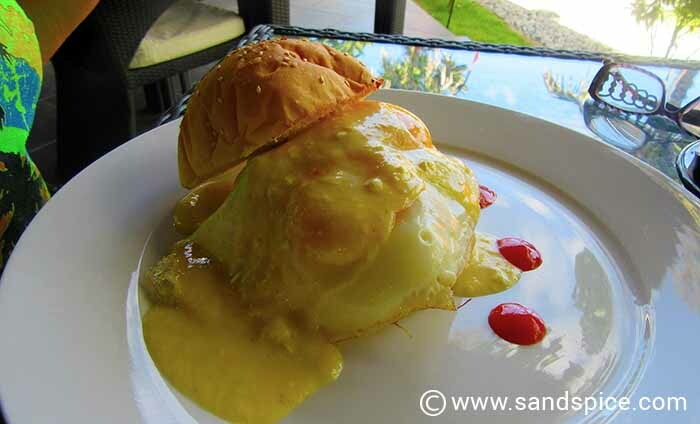 We had a breakfast of eggs benedict with tea for two, and our bill came to IDR 118,000 (€8). The L Good Bar & Grill is clearly targeted at affluent foreign customers with the accent more on western tastes. For many travellers, a holiday isn’t complete without a bit of alcohol to mellow down at the end of the day. In Lembongan, you can purchase alcoholic drinks at most of the restaurants. 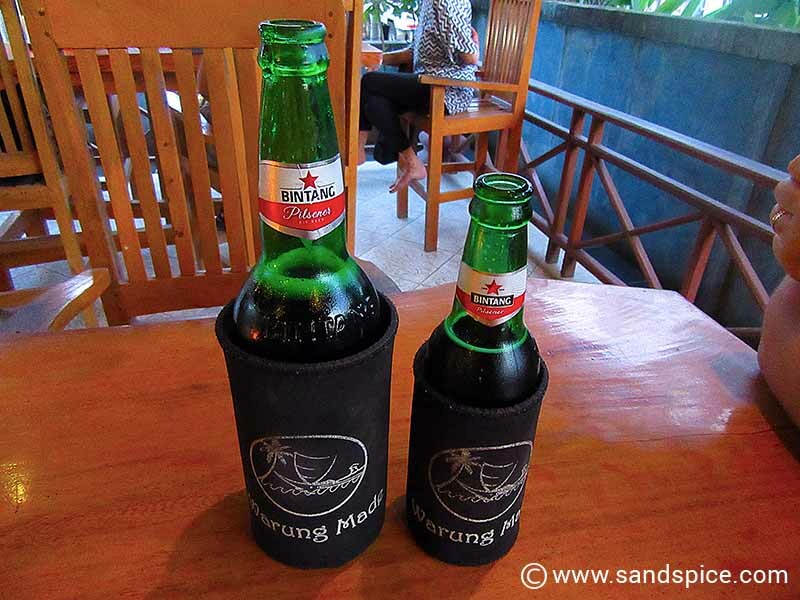 A small Bintang beer costs IDR 25,000 (€1.50) a bottle, and its bigger brothers cost anywhere between IDR 37-45,000 (€2.50-3.00) a bottle. A glass a wine will cost anything from IDR 50,000 (€3) upwards. Cocktails also cost around IDR 50,000 a glass. The good news is there are a couple of shops where you can buy bottles of spirits. Not far from Sandy Bay, we bought a bottle of Gordon’s gin from the Sunset Coin Restaurant on the Jalan Sunset Beach for IDR 360,000 (€23). They were also selling a few other spirits for the same price. This was a lot more than the IDR 160,000 we paid for a bottle of Robinson’s gin in Ubud, but beggars can’t be choosers. There is another shop that sells spirits in Jungut Batu, but we could never find it open. 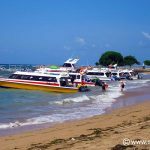 Important as it is, our trip to Nusa Lembongan. wasn’t all about eating. We planned to burn off the calories with some long walks around the island. There were beaches and coves to discover, as well as mangrove forests and underwater scenery that shouldn’t be missed. We were hoping that the next 8 days would be enough to see it all.